Although the Splintered Forest headquarters is in Evergreen, Colorado the crew completes numerous projects throughout Golden as well. Whether you need help with your tree removal, tree trimming/pruning or fire mitigation project, our fully licensed and insured crew can help you with your next project. Give us a call to discuss your next fire mitigation, tree removal or crane project. 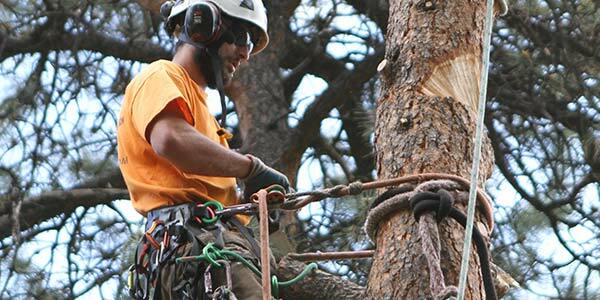 At Splintered Forest, we understand that not every tree removal or fire mitigation project is the same. That is why our ISA Certified Arborists take the time to come to your property and provide you with an estimate for your project, free of charge. Splintered Forest’s Arborists are able to walk the property with you, explaining why certain trees have been chosen to be removed or they can simply place colored tape showing you which ones are to be removed (blue tape) and which ones are needing to be trimmed (pink tape) – your choice! Note, Splintered Forest uses Colorado State Forest Service (CSFS) guidelines when marking properties. To learn more about these guidelines click here.